This well-produced resin set converts the Monogram DC-3/C-47 into the Russian license-built variant. The Lisunov transports differed from their Douglas cousins by the use of Shvetsov M-62 9-cylinder, single-row engines in place of the original twin-row Pratt and Whitney R-1830s. This engine was a license-built Wright Cyclone copy. More than 4500 Lisunovs were built, perhaps more according to the source. 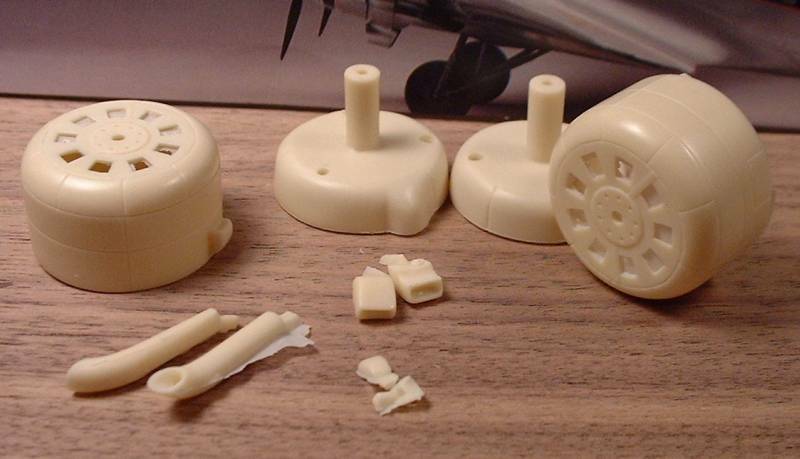 Consisting of ten cleanly cast, tan resin parts, the Airwaves set provides the circular engine cowlings with front shutter, wing engine mounts, intakes, exhausts and two small airscoops. The nine-cylinder engines are not provided, but you can use any 1/48 Cyclone engines from, for example, a Monogram B-17 or white metal aftermarket parts from Aeroclub. Or even simpler, create the closed internal cowling shutters from thin plasticard. As is usual from Airwaves, the parts are extremely well mastered with very fine cowling scribing and shutters and nicely done intakes and exhausts. Casting is first rate with no bubbles. The resin engine mounts fit beautifully to the Monogram wing. It should prove to be a simple and trouble-free conversion. Thanks to Airwaves for the review sample.